Located in the Inn’s Le Chateau property, this mid-size second floor room is decorated in sage green and flowers with period antique furnishings. A wall of bright windows overlooks the home’s croquet lawn and fieldstone enclosure. A fireplace provides ambiance and is visible from the plush queen bed and whirlpool tub. The private bath has a tub/shower. Fireplaces are operational from late-October thru April. Air conditioning adds to your comfort during the summer months. 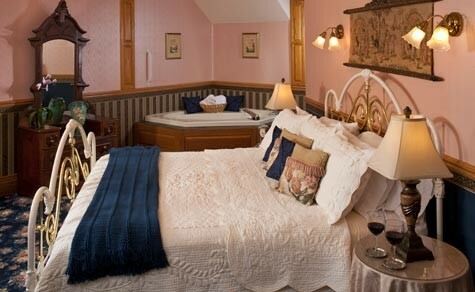 Experience a perfectly romantic lodging near Apostle Islands during your stay in our Bayfield, WI bed and breakfast.